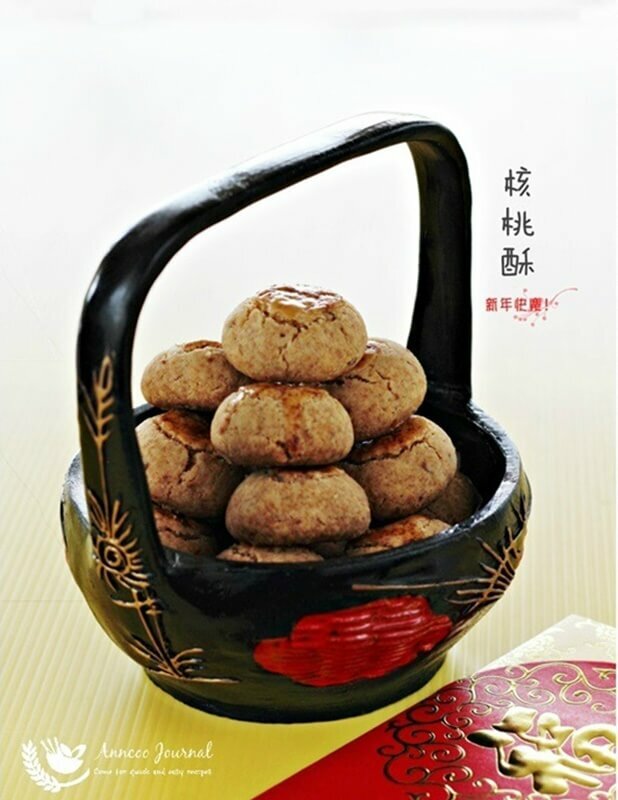 I love Hup Toh Soh (核桃酥) or Chinese Walnut Biscuit for their crunch and fragrance. I remember that when I was little, the Hup Toh Soh was quite huge in size about 3 inches in diameter or even larger but strangely that there wasn’t any walnuts in it. 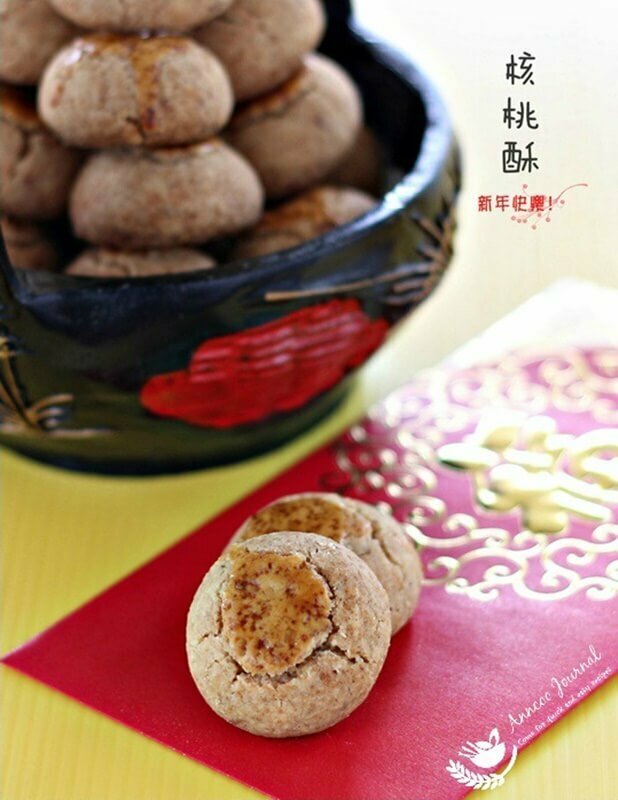 Wonder why it’s called Hup Toh Soh (meaning walnut crisp in Cantonese)? 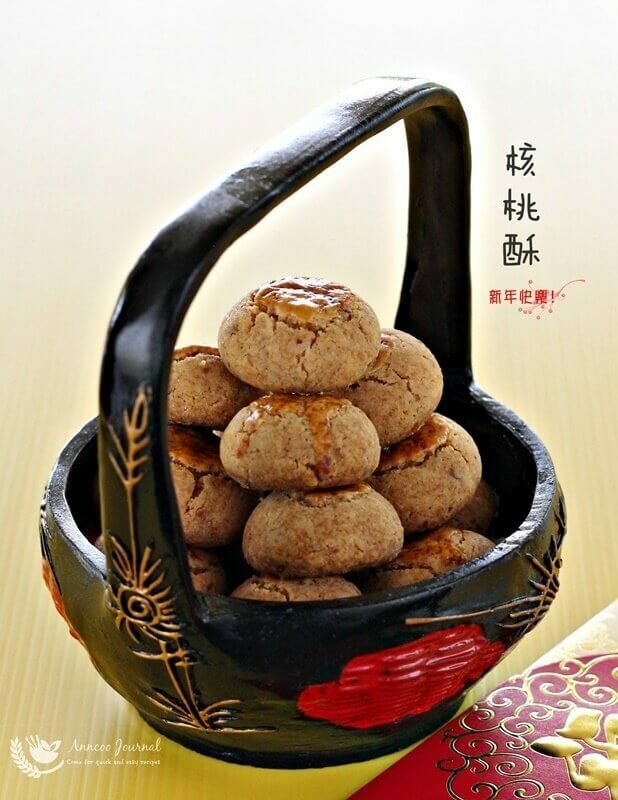 This Hup Toh Soh recipe was adapted from No-Frills Recipes as I like that Cheah had added walnuts into it. The cookie was very crisp, nutty and little savoury but my cookies don’t look like Hup Toh Soh at all. I just like to make it small so that I can pop the whole cookie into my mouth. So if you want to make it bigger, please go ahead 😀 Definitely a keeper recipe for the upcoming Lunar New Year! 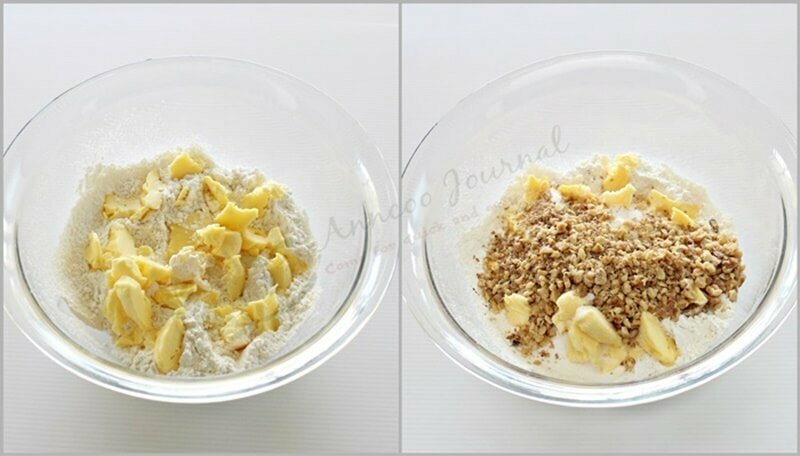 Sift the self-raising flour into a mixing bowl. Cut in the margarine, add in the sugar and the chopped walnuts. Using a rubber spatula to blend the mixture. 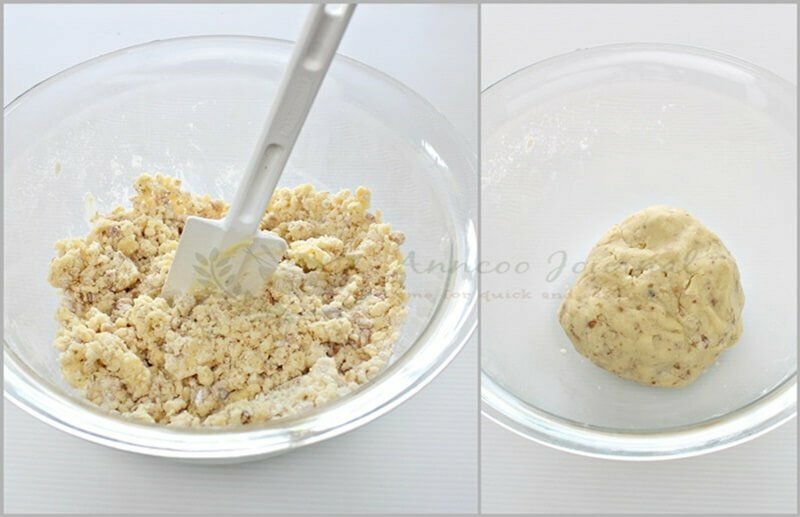 Then mix thoroughly till the dough does not stick onto the hands. Pinch off some dough and lightly form into a ball, make a small dent in the center. Place the biscuits onto a baking sheet, leaving some room between each biscuit. Brush them with beaten egg. Bake in preheated oven at 180 deg C for about 30 - 35 minutes till golden brown. Cool Completely before storing in cookie jar. hosted by Miss B of Everybody Eats Well in Flanders and co-hosted by Charmaine of Mimi Bakery House. Hi. Can I use butter instead of margerin? Hi Ling, use butter is not that crispy compare to magarine or crisco shortening. Can you advise the brand of margarine used? Thanks. Hi Eva, I used Daisy brand. Actually any brand will do. I see that supermarkets like NTUC display some brands of margarine (such as Planta) on the shelves instead of refrigerated section. Do we keep the margarine in the fridge at home? Margarine is vVegetable-oil-based, so no need to store in the fridge. You can also use ghee or crisco shortening in this recipe if you don’t like margarine. Can you also advise how to roast walnuts? Thanks!! I toasted the walnuts in the toaster oven at 180 deg C for about 5 mins. Leave them to cool before grinding. Is it a must to use margarine ? Can we use butter? Hi Shirley, Butter will melt and the cookies won’t be that crisp. Can use ghee or crisco shortening instead of margarine. Yes Beiz, can use 150g crisco shortening. Gorgeous yummy. My husband favourite. Look so easy to make. Thanks for sharing. 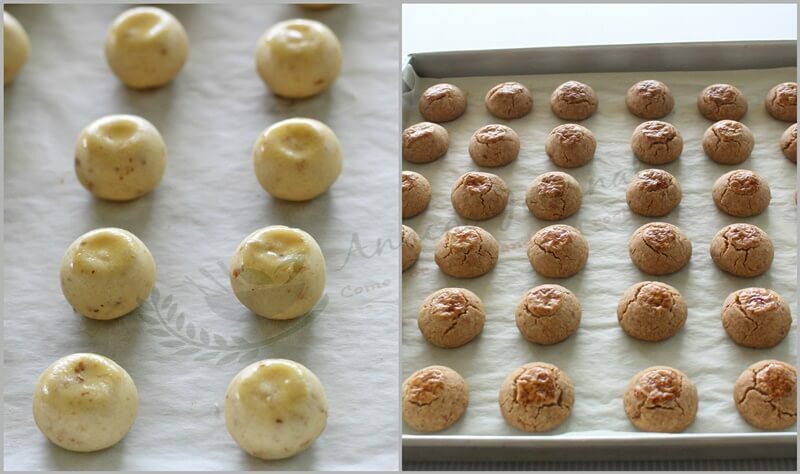 Ann, I like your small size walnut cookies than the original big ones, can just pop the whole thing in the mouth. Love your presentation too! They look so beautiful! Love that cute basket too. Hi, can I use butter instead of margarine? Hi Hwee Yong, I saw some bakers used butter with crisco shortening. Shortening makes the cookie crisp. yumm love nuts especially when used in baking. Hi Ann, I planned to bake this without the walnuts but have to skip it this year cos' I think I have made enough. I like it very much when I made it the last time. Crunchy and crispy. The aroma is unique. I prefer hup toh soh with real walnuts in them too… The store bought are the ko-song kind!!! Yours look wonderful! This looks so good! I love walnuts! I'm sure this is YUMMY! !